What will stick in my mind about Rhinebeck 2017? The bloody roosters next door that started crowing at 2:30 the first night. The next they started at 11:30 PM. No more roosters. And the fact that there were more wheels! We had so many more spinning wheels in the house this time. We are aspinnerating people, muah hah hah. One of the highlights of this Rhinebeck for me was visiting the Golding booth, which I had missed last year. I was just going to admire, but Ceri and Megan got me to sit down at one of the wheels to spin on it, just to have the experience of spinning on a Rolls Royce of wheels. It was incredible. And as a bonus, I spun longdraw, which is not only very relaxing but a good measure of how a wheel spins, since you need to be pretty synchronized with the wheel and its settings to accomplish it. Apart from how good it feels to spin that way, I enjoy sitting down at a wheel and spinning longdraw because it stops passersby. It looks effortless and is super impressive. I get more people interested in sitting down and trying to spin that way. The festival itself was terrific. There were over 38,000 people on Saturday alone, and it felt like it. 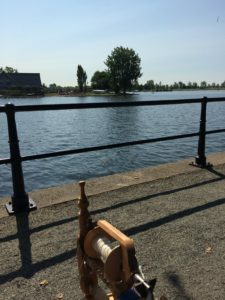 I wrenched my back first thing when we arrived while unloading a rigid heddle loom I’d brought to hand over to a buyer; that plus the unseasonably high temperatures and the crowds knocked me out by 2 pm. 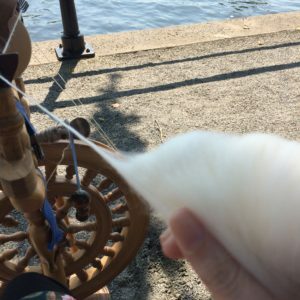 I ended up sitting on the hill in the sun and playing with a new spindle. My list of things to look for was short: Hit Clemes & Clemes for a flicker brush; Into the Whirled for fibre; maybe a new spindle somewhere; and a shawl pin. Clemes & Clemes ended up having their own booth this year at the front of the building ITW was in. I got their last flicker brush (it was only 10:30 am! ), and chose a new orifice hook for my Mazurka. 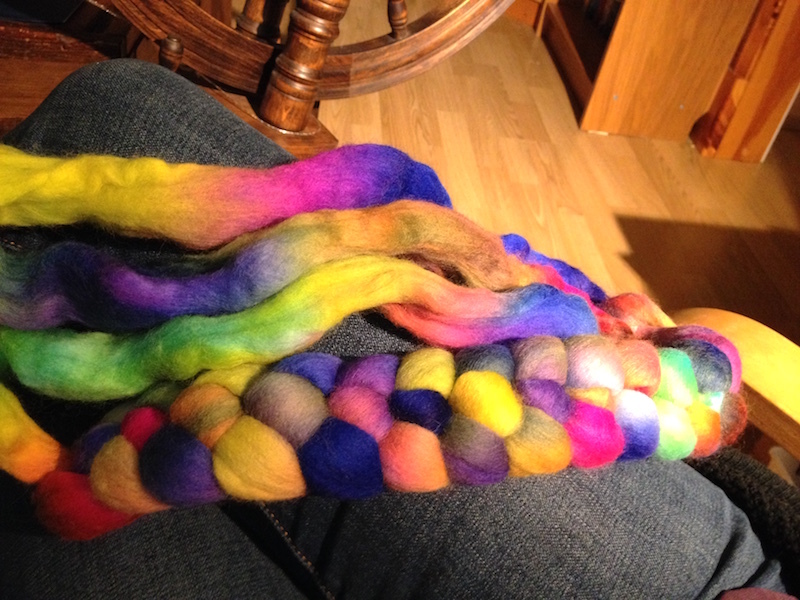 Further down the row at ITW I grabbed a bag of odds & ends fibre and a braid of Falkland. Later that day I bought a Snyder Turkish-style spindle because it had f-holes in it (!!! ), which is a bit on the heavy side for me at 36 grams… but f-holes!!! I decided against a Miss Marple Teacup from the same booth because I had just bought the Snyder spindle. (A decision which I regretted for two weeks, until I contacted Greensleeves Spindles and asked Elizabeth to make one for me. 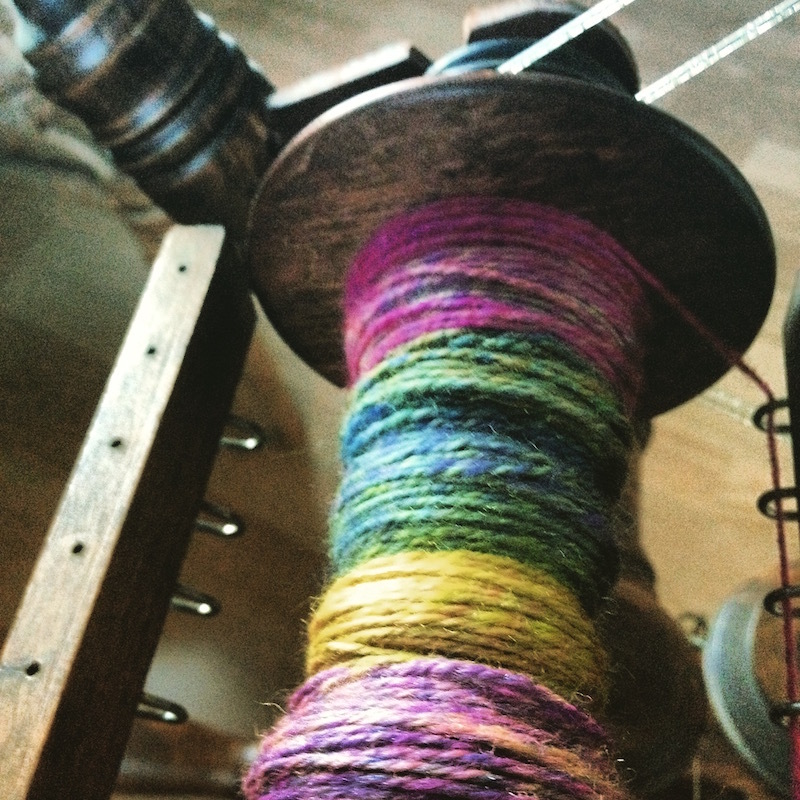 A delightful experience, and I highly recommend Greensleeves Spindles for all your spindling needs. Gorgeous to look at, gorgeous to spin with.) I found a pretty green ceramic shawl pin the next day at 50% off, to complete my Rhinebeck list. 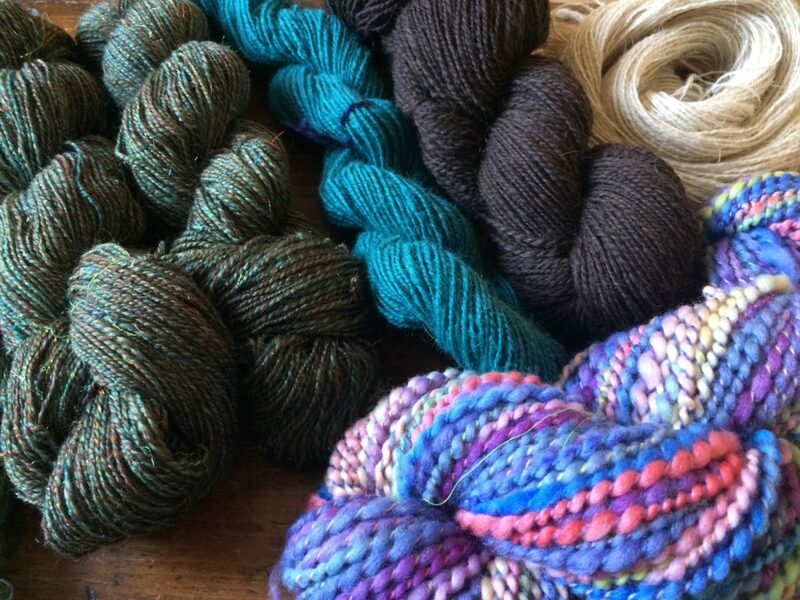 Along the way I bought a bag of four different types of cotton sliver, two braids from Greenwood Fibreworks, an ounce of dyed longwool locks, a super-high-speed Kromski whorl, and a pretty pair of earrings. And I sold that 32″ rigid heddle loom, since warping it killed my back every time. I love weaving. I do not love the tedious setup. Best of all, I got to hang out with my Ravelry mama group friends, whom I only see online most of the year. 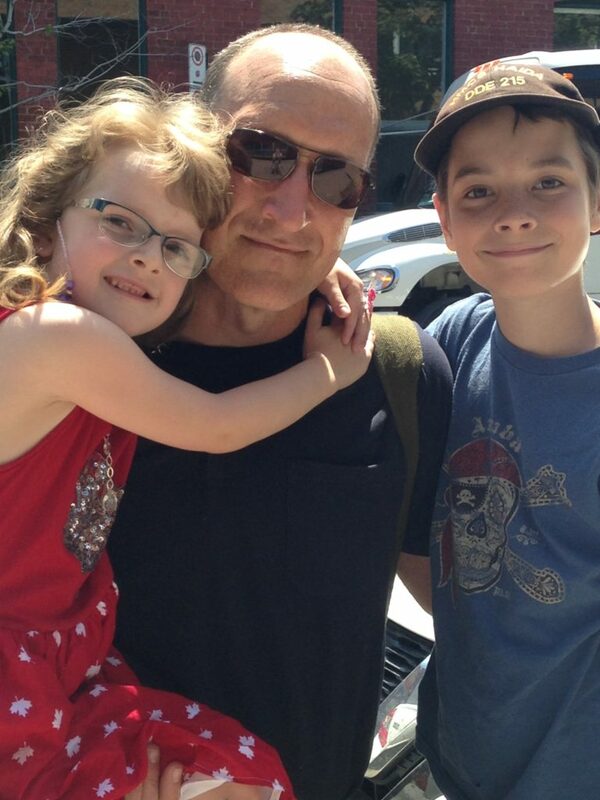 Great weather, excellent companionship, beautiful things to see. It was a wonderful trip. This entry was posted in Diary, Knitting, Spinning, & Weaving, Weather, Seasons, & Celebrations, Words Words Words on October 25, 2017 by Autumn. Tour de Fleece 2016: Day 1! They ride bikes, we spin yarn. It’s all wheels, right? So Day 1 of the Tour had me plying the last 3/4 of my FatCatKnits BFL in the London Fog colourway in order to clear bobbins. Before a wash to finish the yarn, it’s 466.5 yards, 20 wpi. I loved the experience and the feel of the finished yarn, but I’m not thrilled with the colour. 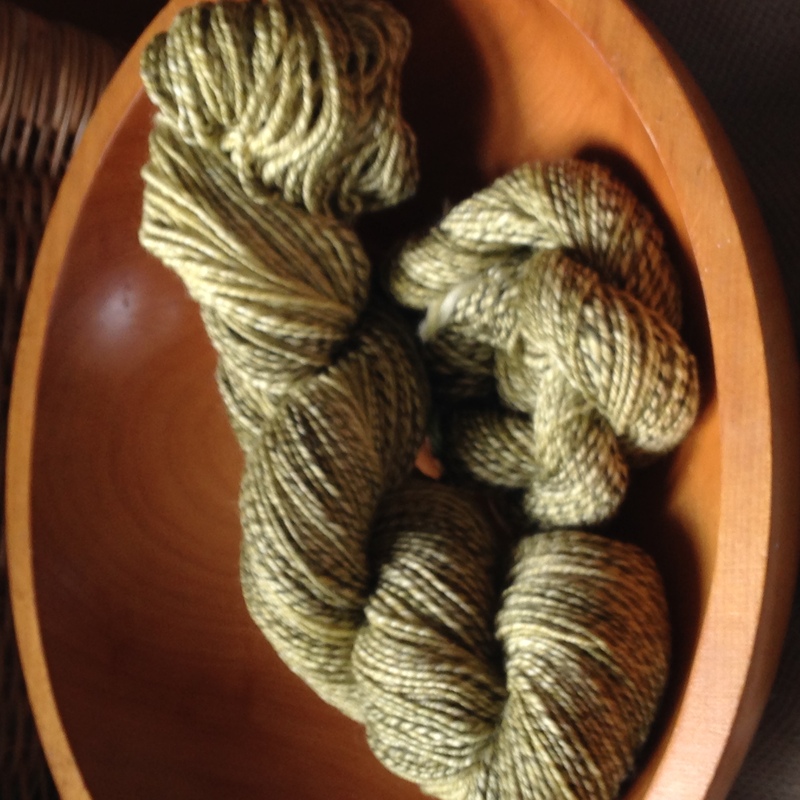 The three-ply barberpoling from a randomly applied colourway… I’ve got a greenish pinkish greyish yarn. If I do this colourway again — and I probably will, because I loved the original braid and it was on my wish list for over three years — I’m going to either split it lengthwise so the plies match up, or spin end to end and then chain ply it. Whatever. It will make a nice shawlette to tuck into the neck of my velveteen fall coats. I was hoping for socks, but I think it’s too soft. 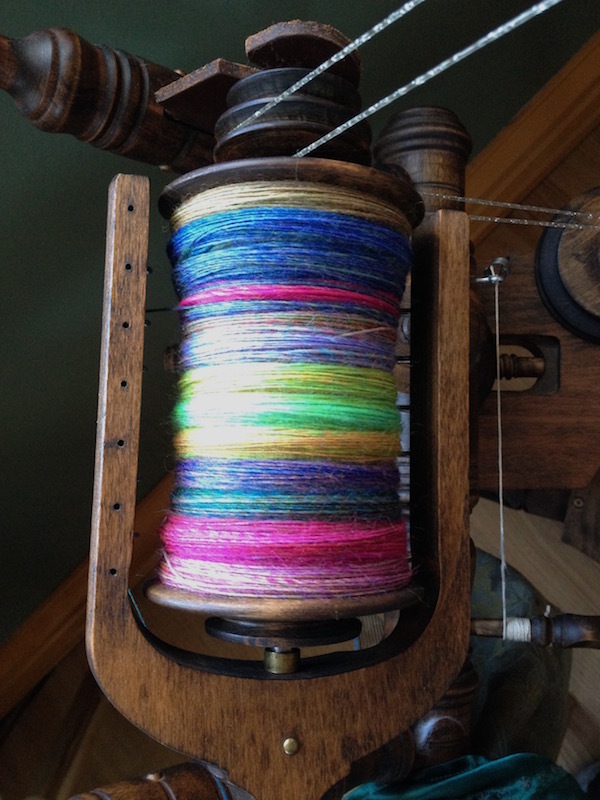 Even though I plied it super tight. This entry was posted in Cello, Diary, Knitting, Spinning, & Weaving, Music, Photographs, Words Words Words on July 3, 2016 by Autumn. I had a concert. It was brilliant. The Grieg piano concerto was fantastic, and the Schubert ninth symphony was better than I expected it to be. (It was also REALLY LOUD.) Right up to the week before the concert I was still thinking I should have dropped out at the beginning of this rehearsal session when I was having so much difficulty with the material; I’m glad I stuck with it. Next: my recital in June, and then the Canada Day concert. The team sent me home with swag for the family, too. It was heavy to haul home — there’s just over half an hour of walking involved in my commute to and from downtown for these in-person meetings — but everyone here was delighted. In theory the two huge hardcover books are for my reference use, but HRH buried himself in one right away because it was directly applicable to something he’s doing right now. We outlined the fifth and sixth sections of the book, so now I have the second and third to cover and have these two on the horizon as well. I am hitting the right tone and level of detail they want, which is good to know; I wanted to have this review meeting of the first two chapters I finished rough drafts of before going into the next set, just in case I was really missing the point somehow. In non-work news, I am finally going to get to Rhinebeck, which is an enormous fleece and fibre festival in mid-October. (The actual name of it is the New York State Sheep and Wool Festival, but no one calls it that.) Ceri, Megan, and I and a bunch of my online mums group are going to meet there; we’re all renting a house for the weekend! (A few houses, actually; people kept saying they were going to go, too, and more houses had to be booked. It’s crazy, and so exciting.) 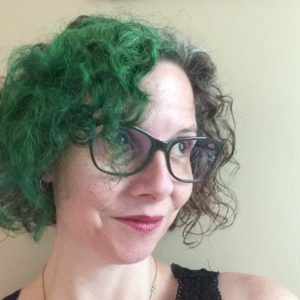 It’s going to be a ridiculous amount of fun, and my phone already knows how to autocorrect Rhinebeck to RHINEBECK, all caps; that’s how exciting it is. For some reason I thought Rhinebeck was much further away. Google tells me it’s just about four hours. That’s not taking border-crossing times into account, but still — that’s closer than driving to visit my parents. And there’s a Rhinebeck thing; people knit sweaters to wear while there. So I am going to knit a sweater. An easy one, mind you, but a real sweater. Once this book is done, that is. I’ve already swatched two different yarns, even, and know which one I’ll be using. Cello, work, yarn stuff. That’s a pretty decent summary of what’s been going on. This entry was posted in Cello, Cogging for Kibble, Knitting, Spinning, & Weaving, Words Words Words, Writing on April 12, 2016 by Autumn. I’ve been so busy with work these past two weeks that my yarn-making has slowed to a standstill. Yesterday my cold was so bad that pretty much all I could do was sit on the chesterfield, so I dragged the wheel over, set up some BBC living history documentaries on the iPad (Victorian Pharmacy, only four episodes, but traces the evolution of sixty years of medical and general services offered by the local pharmacy; I loved it), and spun all afternoon. The braid was destashed unidentified domestic wool, dyed in a great colourway I dubbed “All Hail the Mantis Shrimp.” My guess is Falkland, possibly a lower grade of Polwarth. It was a joy to spin. 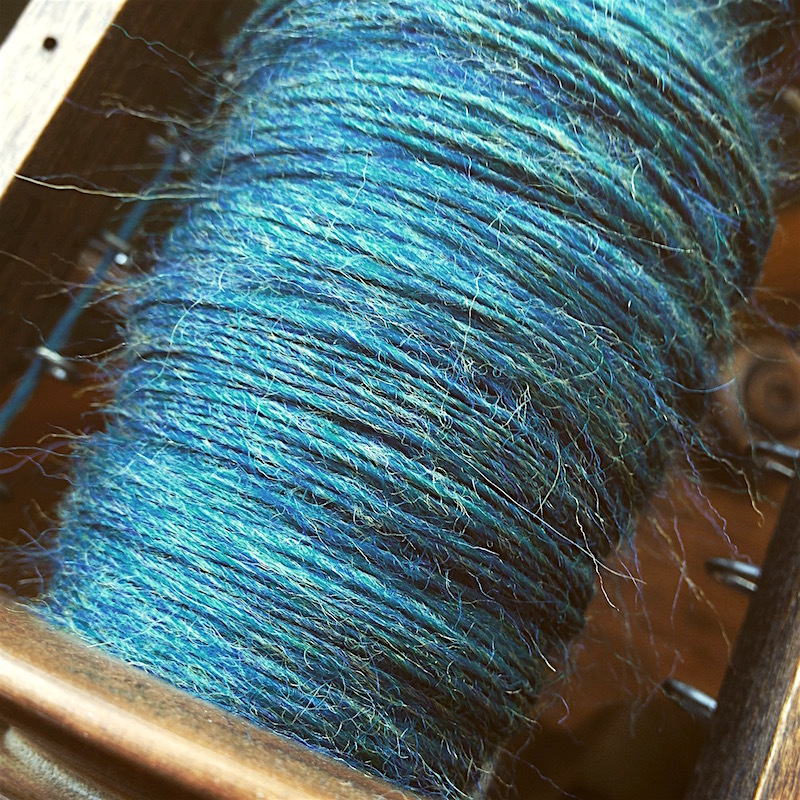 No splitting or predrafting, just end to end spinning across the top. I’m chain-plying it; this is an earlier photo, it’s about three-quarters done now. I like the slight heathering that’s happening. Just before this one, I was feeling pretty run down, which is typical of early January after the holidays. I needed something that was kind of a mindless spin, so I grabbed a packet of the KnitPicks fibre I’d ordered to try in the huge November sale. This was ridiculously easy to spin. 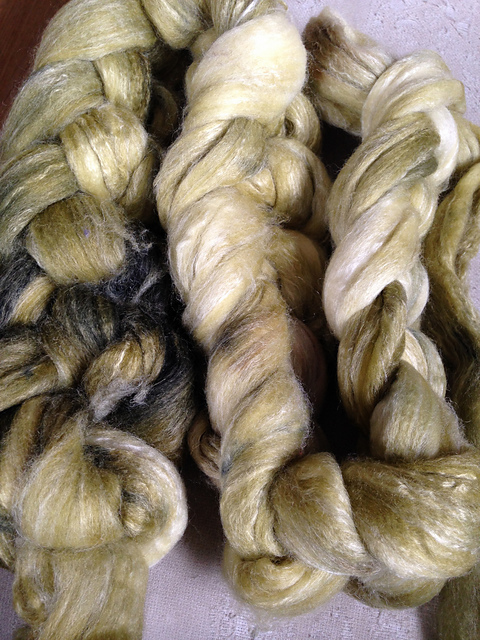 No matting or felting, and while it’s not the absolute softest stuff I’ve ever spun, it’s softer than I expected it to be. (Apparently I am a bit more of a fibre snob than I’d thought.) 28 wpi singles yarn; no idea of the yardage, because I haven’t skeined it off yet (it’s my least favourite part of spinning). 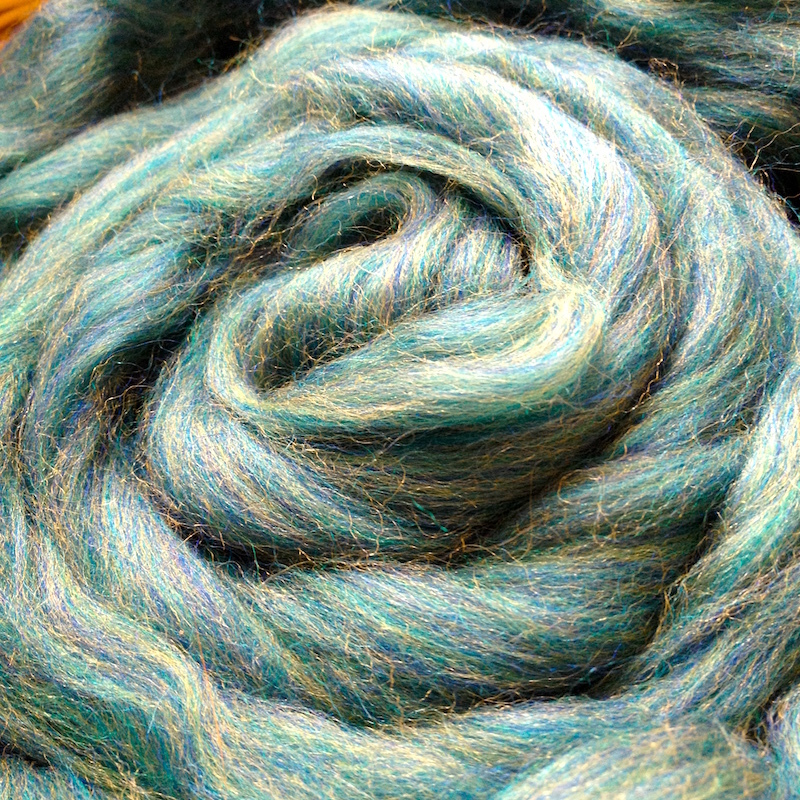 The colourway is “Tidepool,” and is a greeny-blue. It’s really hard to capture in photos. This entry was posted in Diary, Knitting, Spinning, & Weaving, Photographs, Words Words Words on January 24, 2016 by Autumn.